Brushing your teeth twice a day every day is necessary for maintaining a healthy mouth. Most people choose the beginning of the day and the end of the day to brush their teeth, but that doesn’t have to be the case if it doesn’t work for you. Find time in your schedule when you can reliably brush your teeth every day. Set an alarm if you have to, in order to remind yourself. 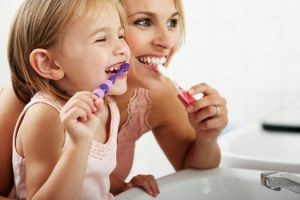 Brushing your teeth only takes a few minutes, but if you’re worried about not having the time, find some time in your day when you can multitask. You can listen to a podcast while brushing your teeth, or music you like to motivate you to brush your teeth. Buy floss. Buy lots of it and put it in a prominent place in your bathroom so you feel compelled to use it. You can even put some in your purse/pocket/car so you always have some with you. That way you don’t have to worry about always flossing at a particular time of day (although that is the best way to form a habit and make sure you don’t forget). If you remember when you get to work, pull out your floss and take care of it while you’re thinking of it. Better yet, by carrying it with you, you ensure your floss is readily available when you need it most. Did you enjoy a kale salad for lunch? Make a quick stop in the bathroom and use your handy floss to get those green specks out of your teeth before that big meeting. Ideally, you should be seeing your dentist twice every year – possibly more often if you’re pregnant or have any other health issues. Make your teeth part of your health goals for this year by calling your dentist now and making two appointments for this year. If it’s been six months or longer since your last appointment, make the first one for as soon as possible and schedule the second for six months after the first. Even if you just make one appointment with your dentist for this year, you’ll be better off for it. Call your dentist now and see when they have an opening. Although our teeth often take a back seat to other factors in our health, they are just as important as every other aspect of our health, if not more so. The state of our mouth is a strong indicator of our overall health, and scheduling regular checkups with our dentist is a great way to, not only stay ahead of cavities, but detect early signs of other health issues, such as diabetes. What will you do to make your teeth part of your health goals this year?